In summer 2015 Andreas Oskar Hirsch finished constructing the Carbophone, an electroacoustic invention pushing the concept of the African Kalimba or Mbira. Vertically set up carbon rods, metal bars as well as a rubber band gamut make up this plucking instrument which opens up a whole variety of sound possibilities and features rather particular overtones. Initially, Early Carbophonics was produced upon invitation by Radiophrenia, a Glasgow based temporary art radio station run by Mark Vernon and Barry Burns, and the pieces were broadcasted for the first time in late summer 2016. 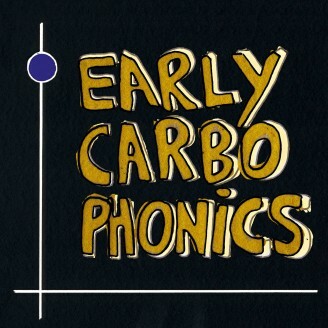 Here, Early Carbophonics are compiled on vinyl, and in contrast to the digitally distributed tracks, the pieces are mixed into each other on the record. Sketches from the rehearsal room are combined with more refined pieces through editing processes, sampling and effects resulting in electronic music with a warm analogue lo-fi feel of its own. Straightly rhythm driven tracks are followed by ambient oddities like the promenade of an octopus or a probably senile shipwrecked robot that emerges from a castle moat and starts speaking to you with a haunting voice. Occasionally, the Carbophone is accompanied by some other instruments like a Morse key, a Moroccan flute or the Electric Palm Leaf.